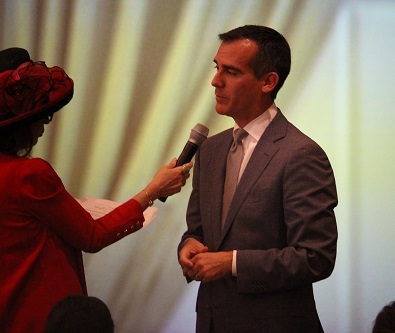 Grant money will lay roots for tree planting in South L.A. The goal of the grant KYCC received is to ensure half of the possible tree sites in South Los Angeles and Pico-Union are planted, creating consistent shade coverage. 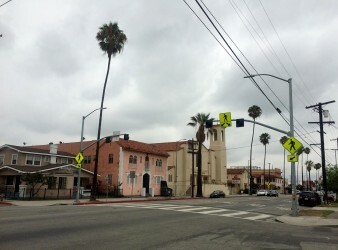 | Rachel Cohrs, Intersections South L.A.
One community organization has a grant to plant trees in South Los Angeles, but first it has to convince local residents that picturesque, tree-lined streets aren’t just for neighborhoods in Beverly Hills. “If you’re struggling on a daily basis, trees might not be the first things you’re thinking about. These communities deal with crime, a large homeless population, illegally dumped trash, graffiti, and gang violence … Most people are just trying to get by,” said Ryan Allen, Environmental Services Manager of Koreatown Youth and Community Center (KYCC). However, Allen and the staff at KYCC know that planting trees can have positive effects in low-income communities. The benefits of having densely planted trees include reduction of energy costs, creation of shade, and the beautification of neighborhoods. 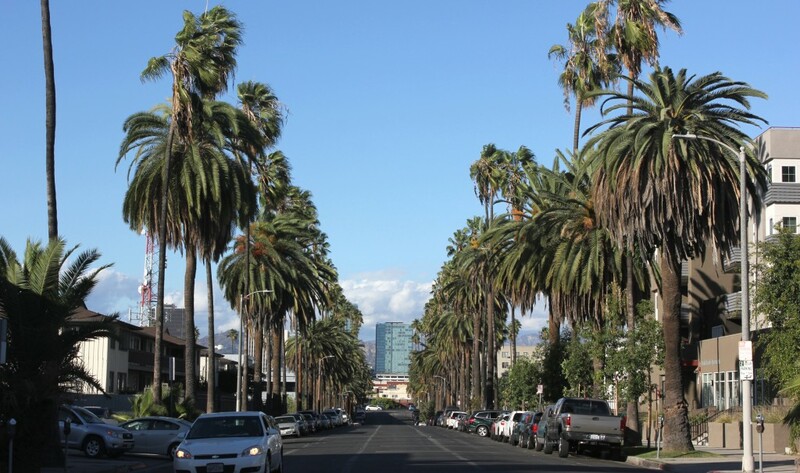 In neighborhoods like South Los Angeles and Pico-Union, which both scored poorly in air quality evaluations, planting trees can help reduce the effects of pollution by removing toxins from the air. “One tree on its own will do those things, but there is the idea of strength in numbers,” Allen said. 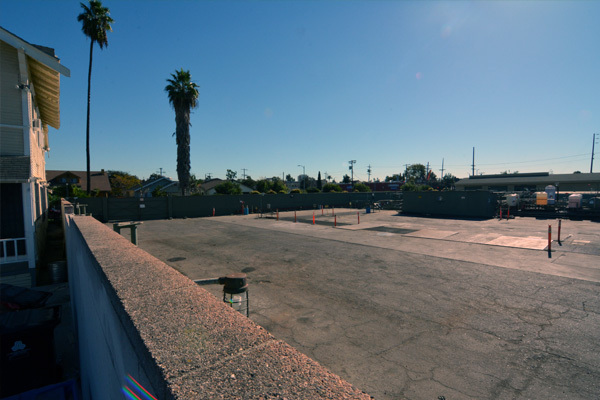 KYCC received nearly $330,000 in grant money from the California Department of Forestry and Fire Protection to make the vision of dense tree cover a reality in the South Los Angeles and Pico-Union areas. The funds stem from a cap-and-trade program passed in California in 2006 to reduce greenhouse gas emissions. Under cap-and-trade, companies have to pay for emissions over a certain limit, increasing the incentive to reduce air pollution. At least 25 percent of the revenue from the program is distributed to greenhouse gas emissions-reducing projects in low-income neighborhoods. 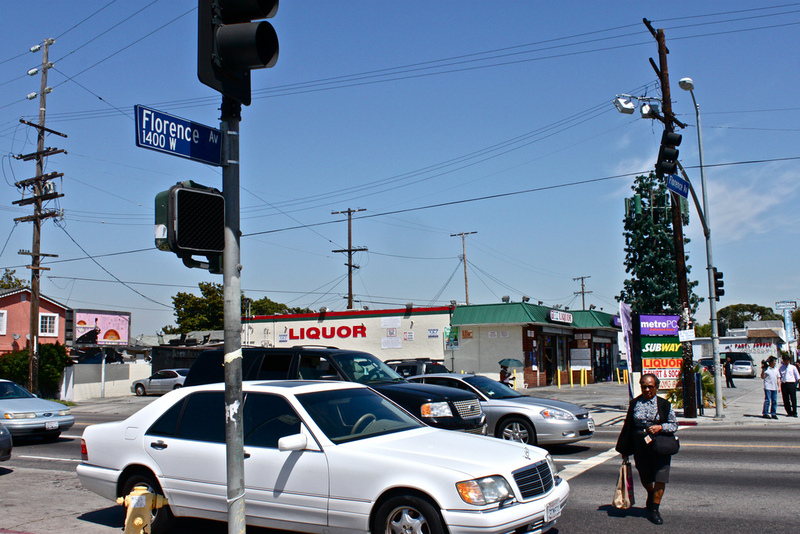 South Los Angeles struggles with high levels of pollution that are compounded by other problems. 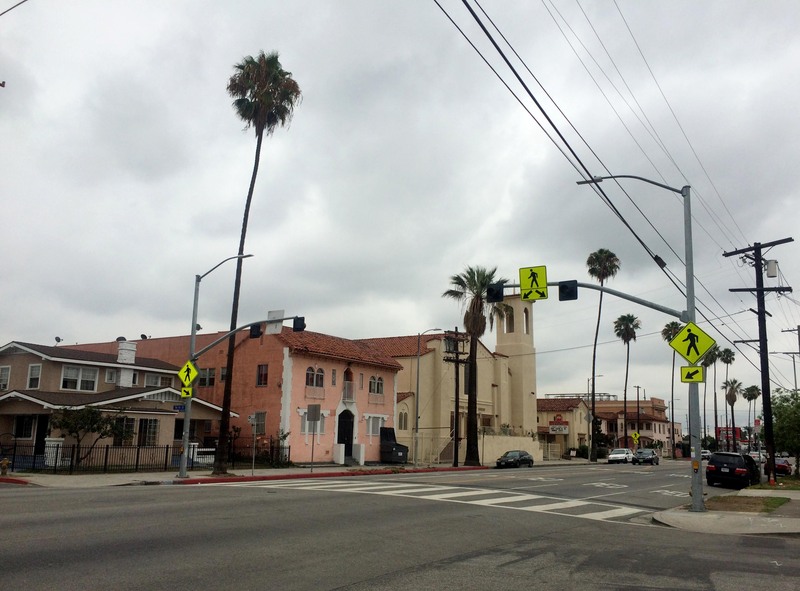 A case study of the area shows that the South Los Angeles area is “disproportionately burdened” by poverty, unemployment and linguistic isolation. 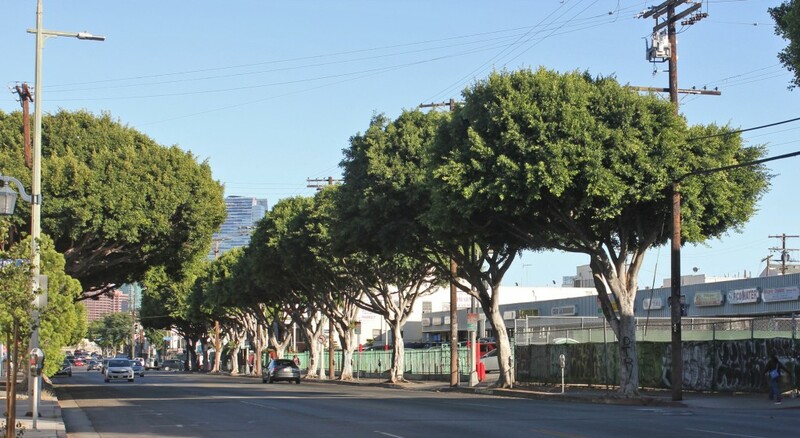 KYCC helped plant small trees between other trees to create shade cover on this street in South Los Angeles. | Rachel Cohrs, Intersections South L.A.
KYCC got the grant to plant 1,120 trees over a four-year period starting in 2016. Its goal in the project is to use the grant to see that at least half of the potential tree sites on neighborhood streets planted. After the initial planting, KYCC will provide funding to maintain the trees for the first three years. After that, the trees will have grown substantially and will need less maintenance work. Despite the benefits of having trees planted, not everyone is on board with the plan. Community members have voiced concerns about tree roots breaking up sidewalks, having to water, prune and maintain the trees, and the trees dropping leaves. 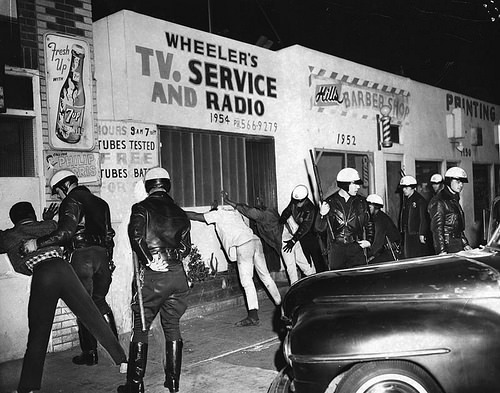 Allen also cited a mental barrier that trees might not fit the culture of South Los Angeles neighborhoods. In the past, trees planted incorrectly caused sidewalks to crack and fall into disrepair. That’s what the KYCC grant is for. Beyond buying trees to plant, the organization plans to reduce barriers and address community concerns. If community members voice worries, then KYCC can use some of the grant money to remove stumps or invasive trees, repair sidewalks, check sewer lines, and other incentives. 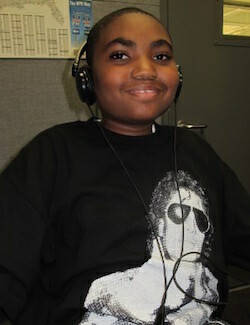 “We are going to try to address different concerns people could have so they don’t have reason to say no,” Allen said. KYCC is qualified to mitigate these potential issues because the organization has been involved in tree planting efforts since 1999, and has expertise in selecting the right tree species and planting them in the right places to ensure they won’t damage sidewalks. The task of physically getting the trees planted is expected to be an undertaking that will require community engagement. Previously, KYCC has gone door to door knocking and asking if residents would like a tree. The new grant is based on individuals taking responsibilities for their own streets and talking with their neighbors to get trees planted. KYCC also plans to help organize community planting events to help get residents’ hands dirty and encourage involvement with the cause. “It takes somebody dedicated, and a certain amount of legwork to work with neighborhood and to get people interested,” Allen said. 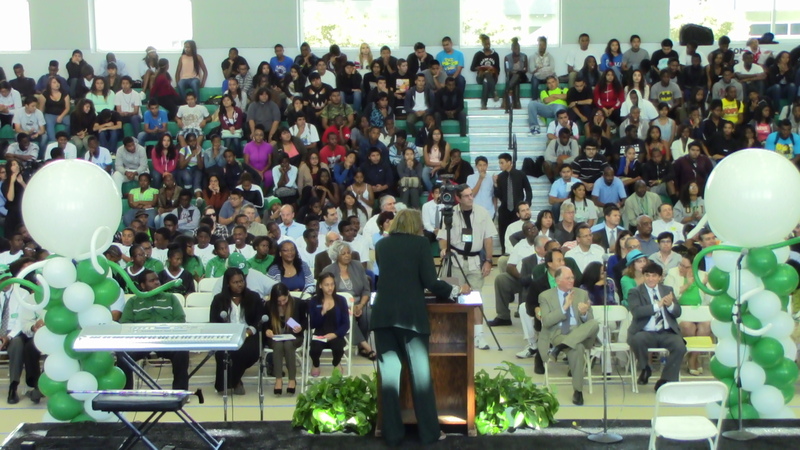 KYCC will be working through community organizations to streamline the process. Allen said the team is just now beginning to work with other organizations from existing partnerships and make new connections. One new organization KYCC could be partnering with for a tree planting project on a different grant is the Redeemer Community Partnership. Redeemer has an independent initiative focused on Jefferson Boulevard to “Make Jefferson Beautiful” by beginning a tree canopy, repairing sidewalks, and integrating bike lanes for safer transportation. Niki Wong, the lead community organizer at Redeemer Community Partnership, said she wants all the area surrounding USC to benefit from the university investment. “USC is right next door. Vermont Avenue kind of serves as this invisible line between two cities….Part of what we are hoping to do is kind of dissolve that line and make the closeness beneficial for folks in the neighborhood,” Wong said. Wong said one of the most important benefits of partnering with KYCC on a tree planting project is the commitment to long-term maintenance and community engagement. The grant Wong applied for through the Los Angeles Neighborhood Initiative would maintain 15 trees, plant 14 new trees, and replace two dead trees. Although the shade will not be provided immediately, within a few years well-tended trees will provide the full benefits. Besides the environmental advantages of having trees planted, Wong also said attractive tree cover could encourage residents to go outside more and help draw businesses to the area. 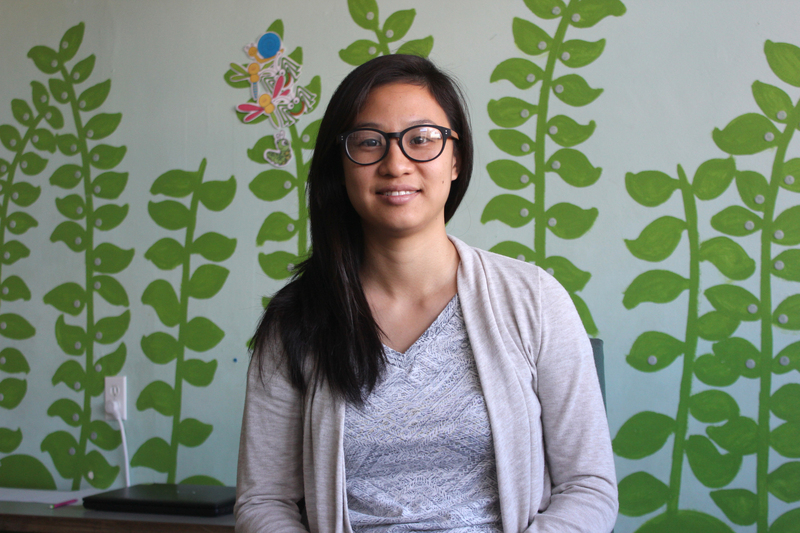 Niki Wong works with Redeemer Community Partnership to get grants to make Jefferson Boulevard safer and more beautiful. 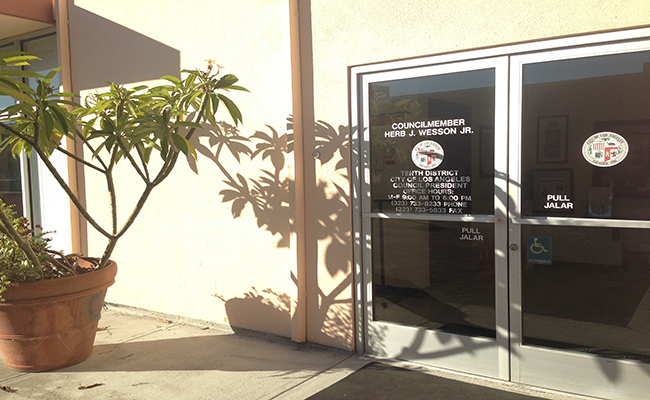 | Rachel Cohrs, Intersections South L.A.
Further, Wong pointed out that even though grant money is being set aside to help remedy these problems, under-resourced communities may not have the time or expertise to complete complicated grant application processes. “This is for a community that has been overlooked, and at the bottom of the priority list for all sorts of improvements. Our crosswalks are faded, our sidewalks are broken, and a lot of tree wells are empty or have dead trees in them. It’s just very clear that there has been neglect,” Wong said. Applications for annual grants will be available for the KYCC grant funds in the spring. 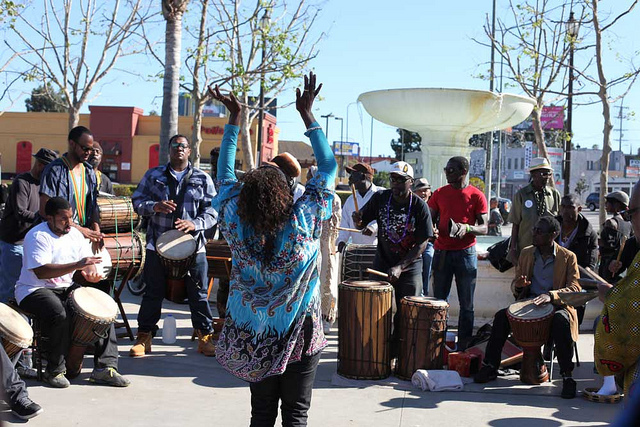 Community organizations can apply and individuals can also get support to build up a tree canopy in South Los Angeles. Both Wong and Allen emphasized that in order to move forward with the projects, community support and engagement is essential. 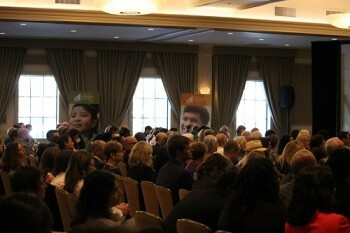 “We want to be helping communities and residents to make their vision for a better neighborhood happen,” Allen said. Networks NBC4 Southern California and Telemundo 52 Los Angeles, in partnership with the NBCUniversal Foundation awarded three local nonprofits $200,000 as part of the 21st Century Solutions grant challenge. A Place Called Home was awarded $100,000 for its “Nutrition and Urban Agriculture Program” addressing the lack of affordable and healthy fresh food options in South Los Angeles by engaging the whole family in gardening, meal preparation, nutrition and vocational training. Boys & Girls Club of West San Gabriel Valley was awarded $50,000 for its “Los Angeles STEM Initiative” created in partnership with East Los Angeles College provides comprehensive training in STEM to Boys & Girls Club staff, which is then taught to thousands of youth members. Clothes The Deal was awarded $50,000 for its “The Disabled Clothing Alterations Program” providing disabled veterans with business attire specifically altered for their physical disability. LA will require buildings to undergo earthquake retrofitting starting in 2016. 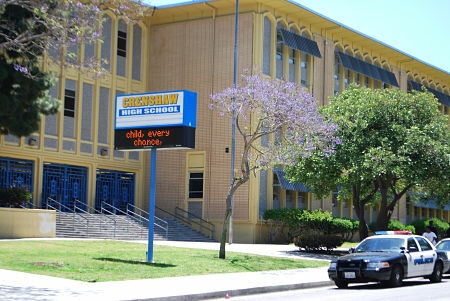 LAUSD has cut arts programs dramatically and is now looking to reinstate programs. 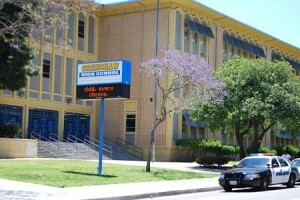 Above, Crenshaw High School. The United Neighborhoods Neighborhood Council met recently to discuss matters in West Jefferson and Arlington Heights, but no one from these areas was present to vote on or discuss the issues. The disorganization and complex content of UNNC meetings may have deterred public participation despite its members’ good intentions. Will Domestic Workers Rights Bill bring change? 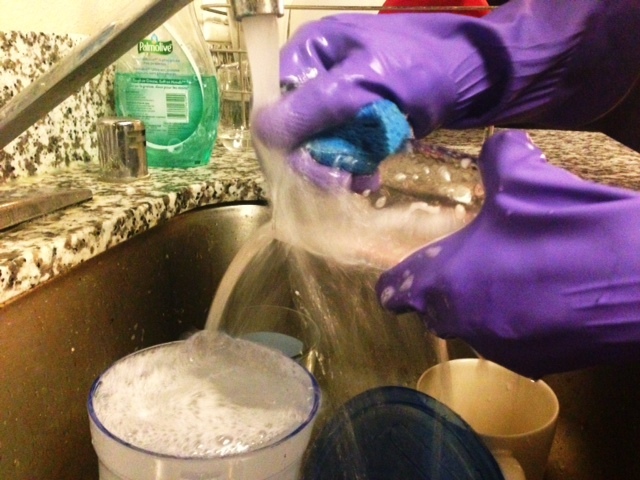 California passed a Domestic Workers Rights Bill back in January that extends overtime hours for domestic workers and assures minimum wage protections. However, some workers still experience injustice such as wage theft in such an unregulated industry. We spent a day with Rocio, who cares for kids at a house in Santa Monica, to learn about the daily life of a domestic worker. Hundreds of students, teachers, and parents cheered today as Dorsey High School unveiled the first renovation in more than half a century.